Light playing on the city, seen from Mount Wilson Toll Road. Watching the sunset from above Henninger Flat. 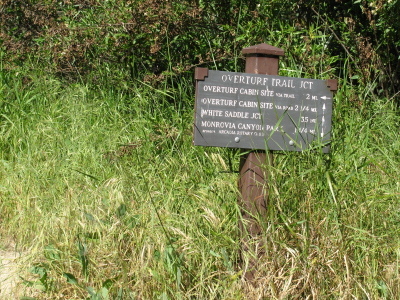 I was looking for an overnight backpacking trip with plenty of sights and settled upon a plan heading out of Monrovia Canyon Park up Sawpit Canyon. We would go up to Stone Cabin Flat, probably about 9 miles. In the morning, hike back via Mt. Bliss, about 1 mile off the trail, and stop in Deer Park for a while including dinner, then hike back along the road in the evening. This way we'd get to see quite a bit and really have 2.5 days, sort of, since there's a nice long rest in the second day before the evening hike out, which should be quite safe along the road. Of course if, say, we'd not been backpacking for too long and hadn't quite got everything together so needed to go about getting a few things in the morning and had overestimated our ability to carry extra pounds, etc, there was still the option of only going to Deer Park and being a touch on the lazy side the second day. So a bit after lunch we parked on the street outside the park so they wouldn't have to call search and rescue for us when they found the car in their lot and if we really got to all that next day stuff, we'd be back down too late to get out again. The hike along the road was the regular dreary and flat bit. Shade from time to time, a car from time to time. Just past the kiosk, the road up to the dam and points beyond turned away from the park road. We turned up it. It climbed enthusiastically with a great many tight turns. The up was tough and some reshuffling of food items happened. There were still cars from time to time. When we got to the Boy Scout camp, it was quite rocking. Further on, we finally left pavement. 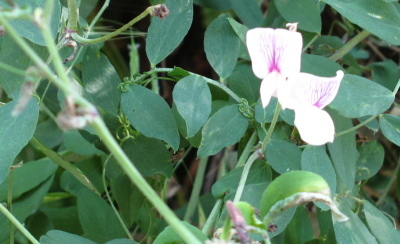 A sweetpea along the side of the road. There were a few of these blooming. Plenty of butterflies fluttered here and there. A fork in the road: two ways up to Deer Park, the site of the Overturf[f] Cabin. 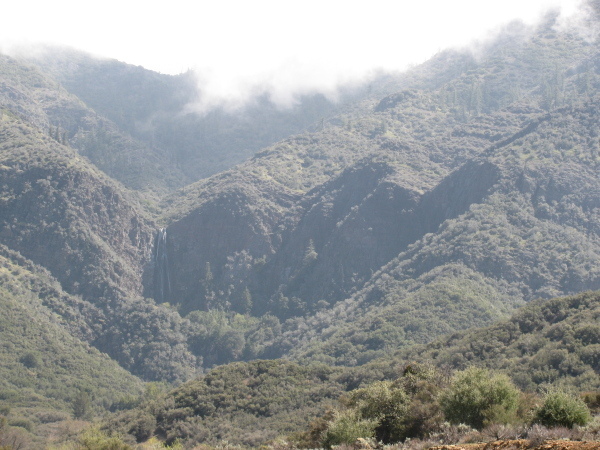 This is a hike that looks like it would be a nice add-on to a Henninger Flats excursion. It should be mostly easy, as it's along an old road, with plenty of views to the south. 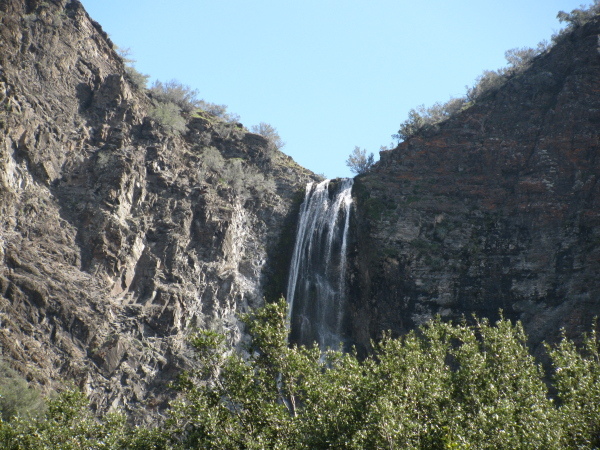 It has been used by Christopher Brennen for one of his adventure canyoneering hikes to then proceed down the glen. That has some 9-12 rappels of up to 80 feet, so the whole loop isn't a good choice for a hike. However, he says the road only has a couple of bad spots and a lot of brush (as of 1999). The road starts above Henninger Flats, just above some water tanks. The purple line here starts at the main campground and museum, where most people taking exercise on the road seem to turn around. 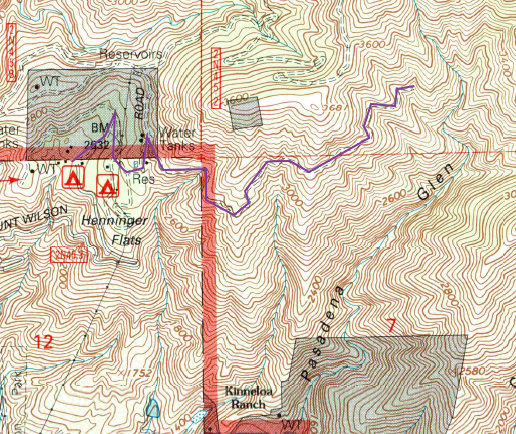 It's a little further up, past the other two camping areas, to get to the old fire road marked on the USGS maps. Brennen provides a good description for finding the road as well as other useful bits of information, like a use trail down into a lower part of the glen from one part of the road. I scouted for this road one evening when I'd decided to take a "quick" hike up to Henninger on 24 Apr 2011. I took the trail up through the campgrounds instead of past the county firefighter buildings and started looking above there for the road. A couple of spurs of various use can be found before the road, the second might even be tempting to someone hoping they'd found the road. I looked up along the mountain to see the cut of the road and followed it along to the main road and could see that it should be coming down a little higher. It is hard to see at the higher spot. A large berm has built up at the edge of the road and it is heavily overgrown. There was not even the suggestion of a use trail heading through the vegetation. It is possible that people go up the hill from a lower spur to the old road cut, but it looks like it would take a fair amount of work just to start off through the thick growth. Since it is thick, not a lot of yucca to stab at you along the way. Personally, I think that if there was a good trail here, people would use it. Who do you talk to about getting a trail restarted? I was hoping to be going backpacking soonish, so needed to have a few hikes in the last little while. Having frittered away Saturday, there was still Sunday. But I'd already said I'd go to a lunch party and so the day began with baking bread to have something to take. The day didn't start all that early, I admit. Then there was the eating and talking and eventually the heading out. 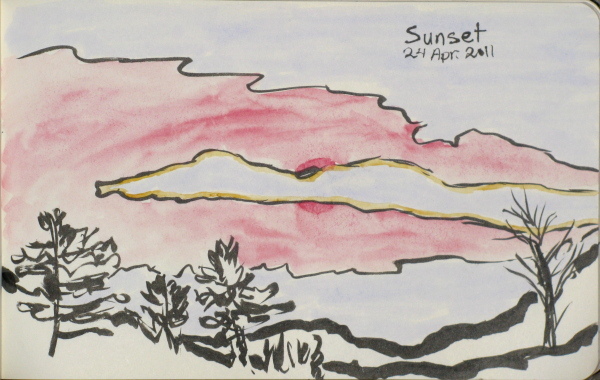 I grabbed the water and trimmed down sketching tools and something warm and headed out to the end of Mt. Wilson Toll Rd., finally starting up it at nearly 5:30 PM. I headed out by the gate that would be closed by the time I got back. The clouds were thick overhead, but not continuous over the whole sky. As I rounded one curve shortly after the bridge, I noticed a bright form, mostly of buildings, off in the distance. 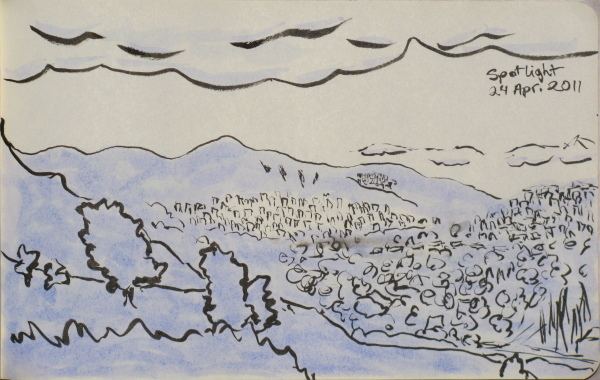 A fair bit later when the lay of the land was better visible, I sketched the oasis of light. This is more experiment with the newly ink filled water brush. I went after it just a little too fast, having forgotten how long the paper needs to allow the ink to dry to fairly waterproof. That was still less than a mile up, so I kept on going. I noticed many flowers on the way including some large bell shaped purple ones and the white bunches of flower on a tree I drew some time ago. Once to Henninger, I decided to take the trail through the three campgrounds instead of the road. I've never seen the two upper campgrounds except through trees. They were a little more pleasant than the lower one that must get most of the activity since the road also goes through it. I decided to check for the old road that goes into the top of Pasadena Glen. I could see a cut in the side of the mountain showing where it had been. There were also a few mirage cuts, but once the real one was found, the others were obviously not right. I hiked up to where it seemed to come to the main road, which was just above some water tanks as stated. Unfortunately, it's very overgrown. There wasn't even a thin trail to hint at anyone using it once in a while. The brushes were so thick, it was difficult to say where one might walk along it. Definitely need to wear jeans for that if it ever gets tried at all. I then decided I should do some more exploring obvious things I'd never quite got to, walk around the loop to the helipad. On the way, the sun was setting. There was an amazing cloud with gold outline and I thought I'd go ahead and try to portray it. Then I went up to the fork in the road and took off down the route to the helipad. I started down the more used side of the loop to the south. The two parts got close enough and there was a crossing between near an outpost of some sort of equipment. There seemed to be a camera up on a pole near it. As I walked around it, I noticed ears and thought they must have one of those fake owls to scare off the other birds. 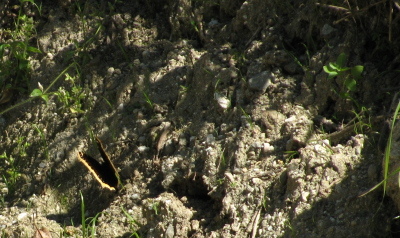 Then the owl stretched out its wings and took off. Guess it wasn't so fake after all even though it hadn't seemed to move up until then. I walked all the way down to the end. The end came to a very steep slope with Eaton canyon far below. As I turned down the north side of the loop, it was getting fairly dark. It was hard to see the far canyon wall and contents. This is supposed to have an old, disused fire road at the bottom of it. When I got to the lowest point, there did seem to be a road that headed off. The first part of it seemed much more passable, but I couldn't see far with my light. Then I headed back to the main road and down it. Since it was after sunset, the gate would be locked so I had to cross the stream. It is much larger than I recall seeing it. It was hard to find a way across without wetting the feet. Since I wasn't wearing my hiking boots and one rock I went for was a little below the water, I didn't manage it, but they stayed fairly dry. I started noticing how much thinner the soles are on the way down, too, so I guess I am now reminded of why one likes hiking boots. Then back to the car and home. I found a hike to a big waterfall that I thought my mom could do even though she hasn't been able to hike for quite some time. On the localtrails site, it said it would be 1 mile round trip and 300 feet of elevation change. I grabbed a camp chair and a few hiking essentials and we drove down past Ojai and up to Rose Valley. There was a sign for the turn off 33, but no sign for the turn from there, so although I was sure that was the right turn, I went on and had to come back. There's not very far to go on from there, anyway. On the way in, we spotted a huge waterfall high up the canyon wall. We seemed to be headed in that direction, so figured it was the waterfall we were going to see. Driving into Rose Valley and seeing the falls coming down the cliff like wall in the distance. Also coming down are the clouds we were escaping. Once there, the parking seemed to be full unless we wanted to block a gated road. I found a spot off the pavement just outside of the campground to park. It was also just past a ford, so I had an extra crossing to negotiate, but it was narrow at the top of the ford and could be jumped. We started down the trail from the campground. It crossed a few streams at the start, then climbed up for one last look at the waterfall before getting close. A closer look at the falls ahead.